The best vegetarian burger: and MORE! Years ago I bought my ex a cookbook designed for men who hate to cook. In it was a recipe for meatloaf four-ways: you would make a triple recipe of a ground beef and pork and whatever mixture and use it four different ways: as a meat loaf, stuffed peppers filling, meatballs and something else. So now I present to you Umami Mix Three Ways. Burgers, Scotch Eggs, and Meatless Balls. The basic recipe makes 12 hamburger patties. If you make a recipe and a half, though, you can have Burgers one night, then Scotch Eggs another, and Meatless Balls another, and quite possibly have some more for stuffed peppers/eggplant/zucchini or kibbe, too! 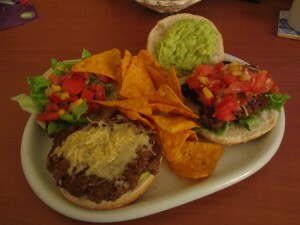 Mexican-Style UMAMI BURGERS with mango salsa and guacamole. With mushrooms, miso and soy, these vegetarian burgers are full of umami. Rinse dried shitake mushrooms in water, then place in a large bowl to soak in 2-3 cups of water. Rinse lentils, then soak. Soak for 1-2 hours. Cook the lentils until just past al dente. If possible, cook them in some no/low-salt vegetable stock for additional flavour. If they get mushy, that’s fine. Heat up a mix of vegetable oil and sesame oil (I find sesame is too overpowering on its own, and expensive, and tends to smoke) in a medium pot. Fry the onion. Lightly squeeze out the water from the mushrooms. SAVE THE WATER! Remove any hard stems or other parts of the mushroom that didn’t hydrate properly. Dice the remainder and add to the onions. Chop up 2 cloves of garlic and add to the pot. Cook until there’s no liquid left. Add 1 cup of bulghur to the pot. Straining out the mushroom water through a fine sieve first, add 2¼ cups of the mushroom liquid. Bring to a boil, then drop the heat to the lowest, cover, and let cook for about 20 minutes until all of the liquid is absorbed. Stir once every five minutes or so to prevent it from sticking to the pot and to check consistency. In a bowl or measuring cup mix: 2 eggs, 1½ tbsp red miso paste, 2 tbsp soy sauce, ground pepper and 1 tsp of thyme. Once the bulghur mixture is cooked, you COULD spread it out onto a cookie sheet or something to let it cool. Or you could do what I did, and just proceed to the next step and just be careful with the making of the patties. Add to the bulghur mixture 3 pieces of crumbled whole wheat bread. I guess you could use actual breadcrumbs, or crush up some crackers, but that’s what I had available. Add the lentils and egg mixture, too. Now grab your food processor (I have one of those hand blenders) and mush the crap out of the mixture until it’s a thick paste-like consistency. Take a large scoop and form into a 1cm thick patty. Fry in a mix of sesame and vegetable oil until browned. I’m sure it would be better grilled, but we don’t have one. Since it’s got a very Japanese flavour profile with the miso, soy, and shitake mushrooms, some sort of interesting sauces would go nicely. For example, Japanese mayonnaise (a mix of chili-garlic sauce and Hellman’s – and maybe a bit of Miracle Whip), or something with wasabi. To make a Mexican themed meal, throw together some guacamole (avocados, cilantro, garlic, lime juice, olive oil) and salsa (diced tomatoes, onion, garlic, mango and/or corn and/or cooked black beans, cumin, cilantro, lime juice, chili powder) and serve with tortilla chips. 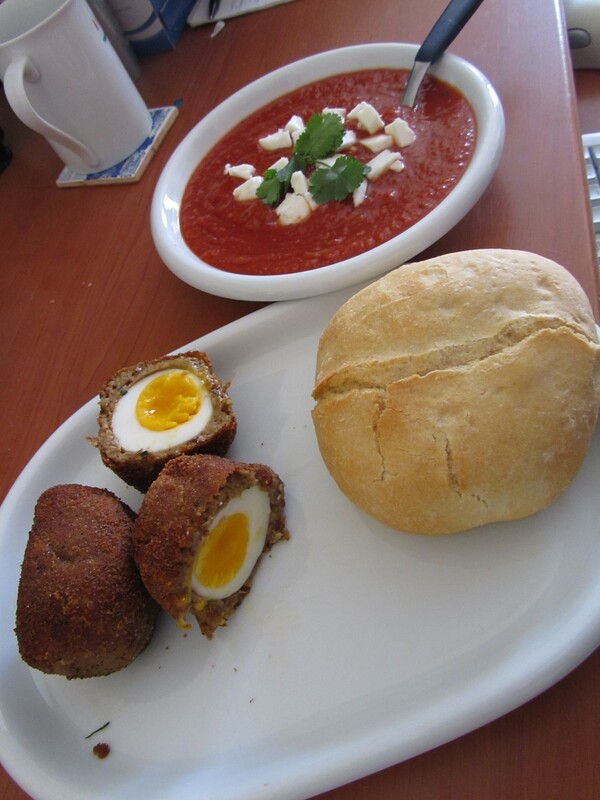 Scotch eggs are an artery-hardening tasty treat traditionally using sausage meat wrapped around a hard-boiled egg. They go great as part of a ploughman’s lunch, and I used to love eating them. But then I converted to Islam, so no more pork for me! So I came up with this vegetarian variation. The cheese and rosemary help mimic the greasiness and flavours of the sausage, methinks, though the texture is different: and that’s fine with me! Eggs went into hot water and brought it to a boil. Ten minutes later, cooled them off. They weren’t quiiiiiite hard-boiled, which is just fine with me, even though it meant a right mess when it was time to peel them. But that’s OK, because they were going to get covered up anyhow, and the “sausage” mixture hid any irregularities. I threw all the “sausage” ingredients and hand-blended them until it was fairly uniform. I then coated my hands in vegetable oil (otherwise the mix would’ve stuck to my hands!) and grabbed a handful of mash. Rolled it into a ball, then squished it flat. Put the egg on it and wrapped the flattened mixture around the egg, pinching it shut around the ends. Then I rolled it around again to try and return it to some semblance of roundness, and dredged it in a breadcrumb mixture I’d prepared before (whole wheat breadcrumbs, garlic powder, salt, pepper, paprika) and fried it in vegetable oil until dark brown. It would’ve been nicer to be able to put it into a proper deep-fryer, but a centimeter of oil in a pan and frequent turning did just fine. Once it was done cooking, I let it drain on a paper towel. If you let it sit for about ten minutes, it’s easier to handle. Take 2 cups of the UMAMI MIX and add ¼ cups of breadcrumbs, some extra spices. I used garlic, but would also suggest an Italian spice mix and/or fresh basil. Because I ran out of basil, I ended up using a tablespoon of basil pesto and two tablespoons of a spicy pesto mix. Break out the old handblender and mix it up, then form into small balls. Fry, turning frequently. Serve with spaghetti and tomato sauce. 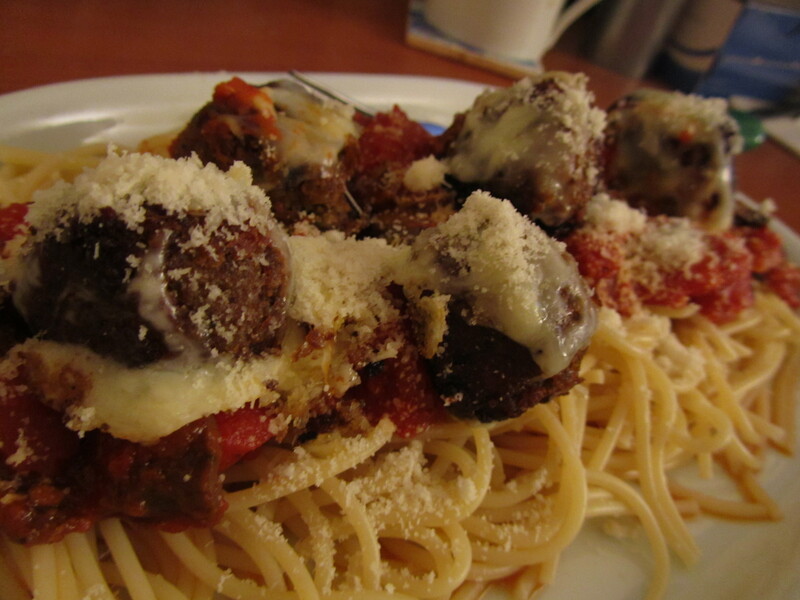 Melted cheese optional- and TASTY! If you try any of my recipes out, please let me know how it turns out for you! Don’t bother leaving a comment here, though, it’s 99.99% spam here. Instead you can email me at coeurinsomniac at that wonderful place called gmail.com.